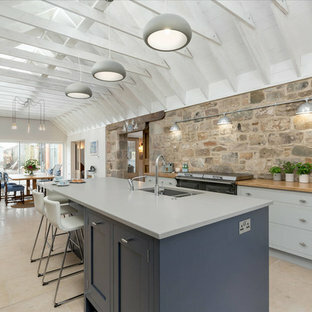 An open plan kitchen/diner and living space in this barn conversion. Inspiration for cabinetry colours and counter top textures were picked from the original barn stone wall to create a homely and comfortable look. DESIGN STATEMENT: GOLD COAST KITCHEN Interior Designer: Darren James www.interiorsbydarrenjames.com.au Precision, attention to detail and an appreciation for the finer things in life are qualities often associated with the German culture. 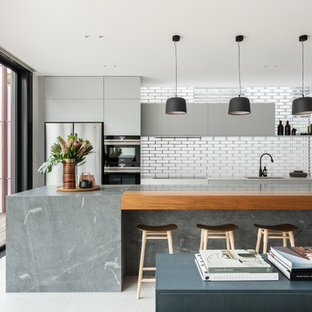 So when the German owners engaged Interiors by Darren James to design and build their dream kitchen they wanted premium quality in every detail: design, materials, workmanship and finish. This project clearly demonstrates what is possible when you combine good design, the latest technical mechanisms, quality materials and handcraft production techniques – a project that exceeds every expectation. Whilst the clients requested an ultramodern design they still wanted it to suit their Australian lifestyle. Central to the brief was the need to satisfy an enthusiastic and demanding gourmand by creating a kitchen that “feels like home” yet still packs a punch visually and supports the entertaining of family and friends. 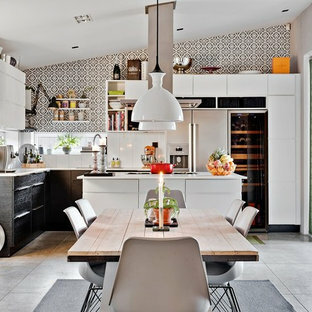 The result is a free flowing functional kitchen design that makes the best possible use of the available space in this long and narrow room. The existing space The original kitchen was small, cramped and non-functional. To pave the way for a larger space highly sought after by the clients, the diving wall that separated the previous kitchen and an unused sitting room was bought down – a concept the clients hadn’t considered until now. The resulting space was a larger room, approximately 7.5 x 3.2m. Starting from scratch we were now able to square set all the walls, ceilings and windows. The existing windows and sliding doors were also removed and replaced with new double glazed windows. 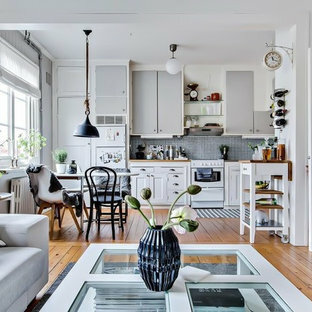 Hidden work space hides the mess and reduced visual depth To shorten the visual depth in such a long room, a scullery focused purely on function is placed at the rear of the room to hide the mess when entertaining and ensures the kitchen is kept clutter free. Housing a large side by side Miele Fridge-Freezer and providing storage for food and everyday bulky appliances, the scullery also acts as an out of the way prep zone. A stainless steel benchtop provides the ultimate surface in terms of hygiene, heat resistant and food preparation for this home chef who avidly enjoys cooking. Wall Oven feature & room divider A strategically placed wall oven feature surrounded by LED strip lighting is suspended 300mm off the floor and 300mm off the ceiling creating a unique floating look and provides access either side to the cleverly hidden scullery. Metal supports and bracing was incorporated into the construction of the wall and thicker timber framing was also used to ensure structural integrity. A selected range of stainless steel Miele appliances included in the feature wall further enhance the cutting edge look whilst providing all the functional requirements of the clients’ healthy cooking style. The black glass finish on the feature door and drawer fronts complement the ‘piano finish’ of the surrounding ‘Ebony Maccassar’natural veneer. In keeping with the desired minimalist look, all the black glass fronts are handless and open electronically using Blums ‘Servo drive’ mechanisms. Thanks to this technology with the simple press of the button the wall oven feature easily transforms from a stunning furniture piece to a fully functional storage space. To complete the high class finish, black ‘intivo’ drawers, black internals and 10mm glass shelves are incorporated ensuring this feature wall remains a showpiece whether open or closed. It is important to note that due to the clients’ sensitivity to formaldehyde all the board that was used throughout the kitchen both internal and external was ‘EO’ class substrate. 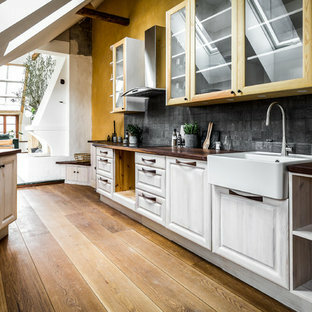 Functional cooking and cleaning zones A number of work zones within the kitchen ensure the space operates efficiently at all times. The cooking zone includes an induction cooktop for efficient cooking whilst the Neff rangehood is cleverly concealed in the piano finish ‘Ebony Maccassar’ natural veneer which is highlighted by LED strip lighting. To enhance the overall look the veneer work on the rangehood feature box is grain matched and mitred to create a superior and seamless finish. The sink area consists of a large single bowl ‘professional series’ Oliveri sink and a water efficient KWC Inox vege spray mixer ensures even bulky baking items and trays are easy to clean. A three bin system is placed at the bottom of the sink cupboard on a servo drive mechanism allowing the client to easily open without the need of any hands. A zip hydro boil with its own font and drain unit is also incorporated into the sink area. Due to its placement above the dishwasher a thicker benchtop was required to handle the drain depth that extends from the bottom of the zip font. For this reason the benchtop is 100mm thick and to create visual impact the ‘Metero’ Staron benchtop reduces to 20mm over and into the cooktop area. Practical Island Bench that packs a punch…. The visually stunning island bench serves dual function purposes. Staron ‘ solid surface was selected for its contemporary appearance as well as for its durability and has been raised 20mm to define a casual seating and dining area. The client has a passion for baking, making her own pastry, pasta and breads. Like many a pastry chef she prefers working on natural stone. 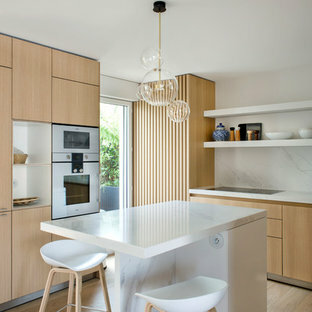 Therefore a 20mm piece of ‘Calacutta’ marble was selected and inlayed into the 100mm Staron ‘Metero’ benchtop. The gorgeous showpiece slab gives the impression of elegance, adds visual character and complements the other natural elements perfectly. Piano finish natural veneer open-shelves supported with steel rods to eliminate the need for visible gables are located either side of the island to house the clients loved collection of frequently used cookbooks. A custom made stainless steel light rack provides functional task lighting, bottle glass storage and further enhances the professional look of this ‘home chef’ style kitchen. Again, supports are positioned between the trusses in the ceiling to provide appropriate support. Storage Storage has been well considered in this kitchen with a scullery providing ample space for groceries as well as specific areas that have been custom designed to house items such as recipe books, small appliances and cutting boards. Every storage item has been thoughtfully located in terms of function and frequency of use. Storage space has been optimized with the use of easy access drawers using Blum’s slow motion drawers. Again the kitchen has been fitted out with the full range of Blum organizational accessories including plate racks, spice racks, knife racks as well as ‘orgaline’ for cutlery and utensil. Luxurious quality finishes One of the main requests of the owners was to include luxurious quality finishes to create maximum visual impact. A combination of different textures and finishes were incorporated to ensure high esthetic qualities as well as top performance. This was created by creatively combining an array of high end materials and textures: The piano finish ‘Ebony Macassar’ natural veneer, black painted glass, automotive high gloss grey lacquer, stainless steel, Calacutta Oro marble and Staron Tempest all combine to create a sophisticated and visually stunning space. The incorporation of the mirror splash back not only adds to the sense of space but ensures nothing is taken away the sophisticated simplicity that this kitchen already boasts. Light it up LED stip lighting is thoughtfully placed for both ambient, feature and practical purposes. 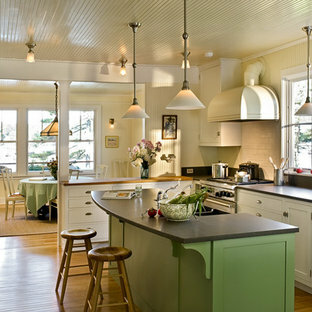 It particularly highlights the stunning design of cabinetry features seen throughout this kitchen. Natural lighting is maximised with the inclusion of a sliding door in the scullery which conveniently opens out to the alfresco area. 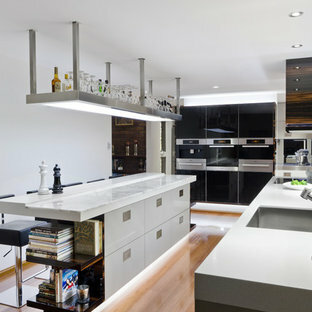 LED Downlights have been thoughtfully placed throughout the kitchen to illuminate task areas and work surfaces. Av Brookside Custom Homes, LLC. 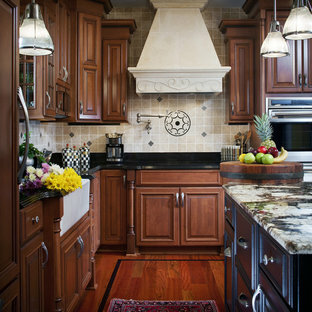 Av Steven Miller Design Studio, Inc.
Av Lobkovich Kitchen Designs, Inc.